Kincora residents are actively engaged in their community and keeping them informed is our top-priority. 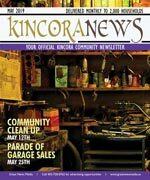 Kincora News is the official community newsletter, and covers community news and is published monthly to keep content current and relevant. Delivered to every household, apartment, and business, every resident is acquainted with the community’s most important information. The Kincora Community Association was formed in July 2008 by residents of the Kincora Community. Membership is voluntary but only those with paid up memberships are members. The Kincora Community Association is made up of volunteers who organize, manage and direct social and recreational events in the community. The Kincora Community Association acts as an intervener in civic matters such as planning and development. In the City of Calgary’s 2012 municipal census, Kincora had a population of 4,876 living in 1,548 dwellings, a 5.4% increase from its 2011 population of 4,625. With a land area of 2.3 km2 (0.89 sq mi), it had a population density of 2,120/km2 (5,490/sq mi) in 2012. For more detailed info visit the City of Calgary community profiles site.